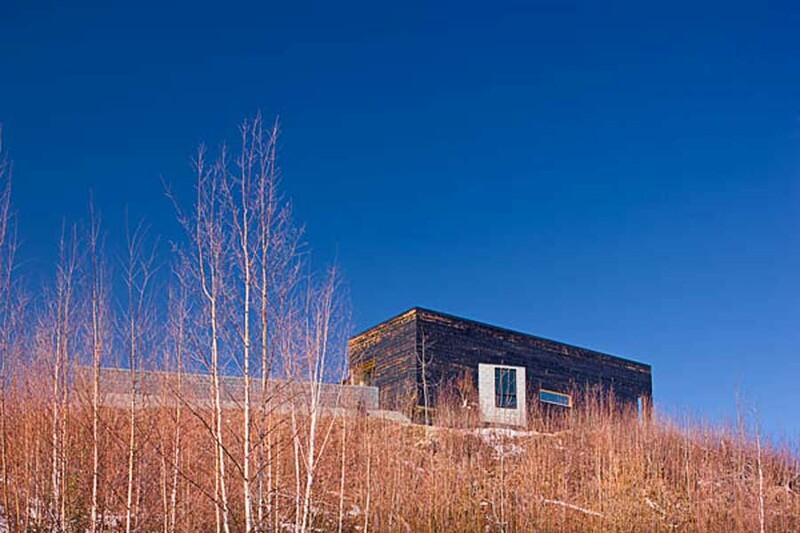 mayer sattler-smith are pleased to announce that the project just received a honor award by the AIA alaska chapter. House for a musher is situated on a 20 acre plot at the edge of a small town surrounded by small lakes and meadows. The site is on a hill, left behind by the forces of the glacial moraine landscape. It is an ideal place to take the dogs for a run into the untouched wilderness of interior alaska. The landscape is dominated to the north by the highest peak in north america, mt. mckinley, or as the locals call it denali (= the high one in athabaskan). The client is a professional dog musher a four time champion of the iditarod, a 1,161 mile sled dog race from anchorage to nome. The family of four desired a “not so big house” and a view of “the” mountain from every room. The design for the house is organized in an L-shape with a common space centered on the view toward the alaska mountain range with “the high one” as a focal point. Carefully selected locations for wall openings frame specific views of the chugach mountains and mount susitna. The bedroom wing extends to the west to allowing each of the bedrooms a view of denali. The house is a refuge and prospect, a point of departure and return. The 2,450 sf house is complimented by a large outdoor court-yard and an accessible roof terrace. The courtyard provides relief from the overwhelmingly expansive natural setting, creating a wind sheltered space with sounds of trickling water, warmth of a fire and a scrawny black spruce tree relocated from the meadow below. The roof terrace offers uninterrupted views of the spectacular landscape and a show of the northern hemisphere sky at night with frequent display of the aurora borealis. The courtyard is formed by concrete walls and surfaces. This “wet” construction follows the topography of the site. The dark wood box forms are orientated to frame the prime views and are made up of “dry” construction. Local alaskan yellow cedar cladding, a very durable and aromatic wood, lines the interior of the main volume in the house. Charred wood siding for the exterior cladding was used for several reasons: a long lasting, traditional low maintenance finish and as reference to wildfires that happen in the area frequently. The dark volumes of the house act as a strong contrast to the natural environment. Some consideration for sustainable design include a heat recovery ventilation system, triple pane glazing and a double furring wall for the exterior walls.